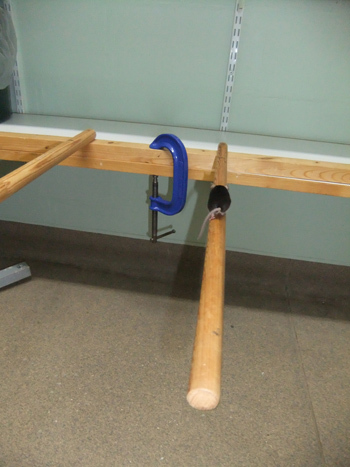 Protocols are presented for two established motor coordination tasks, the accelerating rotarod and horizontal bar, also two tests developed in Oxford recently, the static rods and parallel bars. These tests can detect motor impairments potentially of interest in their own right, as well as being possible variables in tests of other areas of behavior. Deacon, R. M. Measuring Motor Coordination in Mice. J. Vis. Exp. (75), e2609, doi:10.3791/2609 (2013). Mice are increasingly being used in behavioral neuroscience, largely replacing rats as the behaviorist's animal of choice. Before aspects of behavior such as emotionality or cognition can be assessed, however, it is vital to determine whether the motor capabilities of e.g. a mutant or lesioned mouse allow such an assessment. Performance on a maze task requiring strength and coordination, such as the Morris water maze, might well be impaired in a mouse by motor, rather than cognitive, impairments, so it is essential to selectively dissect the latter from the former. For example, sensorimotor impairments caused by NMDA antagonists have been shown to impair water maze performance2. Motor coordination has traditionally been assessed in mice and rats by the rotarod test, in which the animal is placed on a horizontal rod that rotates about its long axis; the animal must walk forwards to remain upright and not fall off. Both set speed and accelerating versions of the rotarod are available. The other three tests described in this article (horizontal bar, static rods and parallel bars) all measure coordination on static apparatus. The horizontal bar also requires strength for adequate performance, particularly of the forelimbs as the mouse initially grips the bar just with the front paws. Adult rats do not perform well on tests such as the static rods and parallel bars (personal observations); they appear less well coordinated than mice. I have only tested male rats, however, and male mice seem generally less well coordinated than females. Mice appear to have a higher strength:weight ratio than rats; the Latin name, Mus musculus, seems entirely appropriate. 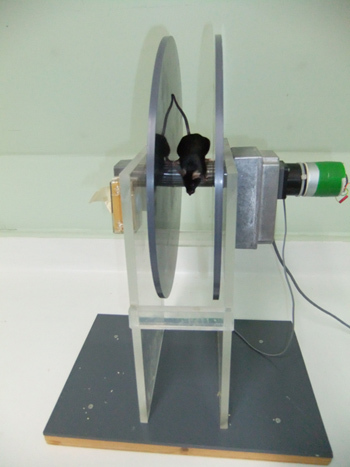 The rotarod, the variations of the foot fault test12 or the Catwalk (Noldus)15 apparatus are generally used to assess motor coordination in rats. Behavior is made manifest by action, and action requires motor skills, including coordination of the body. One of the first experiments in the history of animal behavior was performed by Colin Stewart, a doctoral student at Clark University in the US11. He measured the activity of rats by putting them into a drum and counted the number of times it turned. This early apparatus was probably the forerunner of running wheels and the presently used rotarod test, albeit in the Stewart apparatus the rat was inside the drum, the movement of which was driven by the rat, whereas in the rotarod the animal walks on the outside of a rotating drum or rod which is motor-driven. The original rod used by Dunham and Miya (1957)7 had a set speed, but nowadays accelerating versions (Jones and Roberts 1968)9 are available. The disadvantage of a set speed rotarod is that some animals with poor coordination will fall off at the start, whereas for those that do stay on, the test will soon start to measure endurance rather than coordination per se. The resulting bimodal distribution of data points may be sufficiently abnormal as to preclude parametric analysis. When an accelerating rotarod is used, particularly if it is accelerated only when a set criterion, such as staying on for 10 sec, is achieved, data distribution is more likely to be Gaussian. The rate of acceleration can be adjusted so that motor fatigue does not play a significant role in performance; a mouse is unlikely to be markedly fatigued after just 2-3 min time on the rotarod. The "string test"1, "coat hanger test" or horizontal bar measures forelimb strength and coordination. The two epithets quoted refer to its development; originally a string was used, but the authors noted that performance depended very much on how taut the string was, hence future experimenters used a metal bar, often a coat hanger. We have found that a mouse's ability to grip the bar is inversely proportional to its diameter, and have standardly used a 2 mm bar. In the weights test (see JoVE protocol "Measuring the strength of mice") the very fine wire of a kettle fur/scale collector allows the strongest animals to secure such a good grip that they can lift more than their own body weight. However, using larger diameter horizontal bars can be an advantage as the sensitivity of the test improves; with only a 2 mm bar most normal C57BL/6 mice reach ceiling performance. Hence we have recently adopted a three-bar apparatus; the bars can be readily interchanged as they fit into notches cut into the tops of the supporting columns. The bars are held under tension (especially important to make the 2 mm bar rigid) as they only fit the notches when the supports are slightly drawn together (like a longbow and its string) (see Figure 3). Static rods or beams have often been used to measure coordination, but additional motivation was always used to persuade the animals to traverse the rod. They negotiated a horizontal beam to reach a desired goal, such as the home cage, refuge from a bright light, or food (if they has been made hungry). However, in the course of investigating this type of test, I discovered that mice would spontaneously turn around when placed on the "open" end of a cantilevered rod, and then traverse it until they reached the supported end. This technique eliminates the need for training (necessary in the previously mentioned test variants) as the innate reaction of a mouse to being placed near the end of an elevated rod is to attempt to reach the supported end. This does not, of course, eliminate the problem that motivational changes might affect performance, which is always a possibility with this type of procedure. Cardboard tunnels are presently much used for home cage environmental enrichment, but their disadvantage in the present context is that animals will inevitably be practiced in balancing on cylinders that can wobble about their long axis, mimicking the skills necessary to balance on the rotarod. Thus home cage enrichment could potentially mask a behavioral phenotype; an example is amelioration of a Huntington's disease phenotype by enrichment14. Also animals often walk along the long axis of these tunnels, as when walking along an elevated static beam. Therefore I constructed a pair of elevated parallel bars, and placed the mice in the middle with the forepaws on one bar and the hindpaws on the other, a situation which they would never have encountered before. Mice had to reach the end supports of the parallel bars while remaining upright to pass the test. 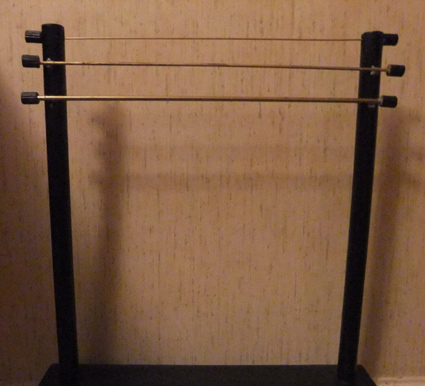 A somewhat similar device was a series of parallel bars placed in a mouse cage to assess the development of scrapie-induced motor dysfunction13. We have now tested several hundred mice for motor functioning at Oxford. These had received various treatments including pharmacological agents, or passive transfer of tissue (plasma) from humans, but mostly genetically modified animals. Some animals were more impaired on strength than coordination tasks, others vice versa. Some mice were more impaired on the rotarod than on static substrates such as the static rods and parallel bars, others vice versa. So the present article and the accompanying JoVE protocol "Measuring strength in mice") describe how to characterize the way different treatments and mutations can differentially affect motor function in mice. 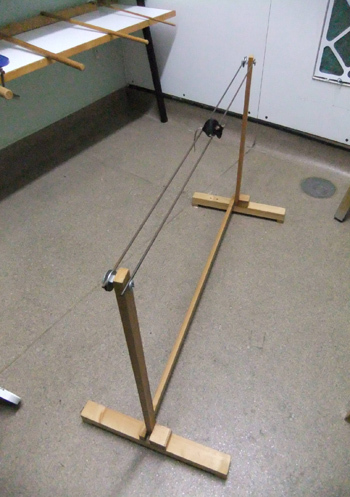 Apart from the rotarod the apparatus described here is simple, cheap and particularly suitable for laboratories not specialized for testing motor skills. For fine-scale gait analysis, the Catwalk system is a much more sophisticated system than older methods such as persuading a mouse to walk through an ink bath and then down a piece of paper, but it is an expensive piece of apparatus. All of these tests are designed to measure coordination rather than strength, although obviously a minimal degree of muscle tone is necessary simply for the mouse to use its limbs. For strength assessment, the inverted screen procedure10 is more suitable, or, if a more graded measurement is required, the weights test or its automated bar-pull equivalent (described in JoVE protocol "Measuring strength in mice"). The exception is the horizontal bar test, which requires both strength and coordination for successful performance. For all tests, a soft padded surface is placed at the base of the apparatus to cushion any mice that fall off. NB This is not shown in the figures, in order not to obscure any part of the apparatus. During the testing of hundreds of mice, both normal and mutant, we have never observed any injury caused by falling from such apparatus, which is typically 30-50 cm high. Also, be sure to clean and sterilize the equipment between each mouse tested. There are several commercial versions of this apparatus on the market, but some have disadvantages, such as failing to accelerate at an adequate speed to detect motor incoordination (rather than endurance). Another common fault is that the rod is not high enough above the base, resulting in mice tending to drop or jump off. The rotarod shown in Figure 1 was made to the design of the author by the engineering sections of the department of Pharmacology, University of Oxford. The rod is 3 cm in diameter, supported 30 cm above the base of the apparatus. The surface is knurled in a series of parallel ridges along the longitudinal axis, enabling the mice to grip it effectively (Figure 2). NB The depth of the ridges is a vital detail; if the mouse cannot get a good grip the test will be very much harder; on the other hand, if the grip is too good the mouse will "cartwheel" around the rod by passively holding on to it. For "amateur rotarod makers" it may be useful to know that knurled wooden dowelling of an appropriate size for mice is available commercially; it would of course need to be treated with a good waterproof varnish before use. The start speed is adjusted to 4 rpm, the acceleration rate to 20 rpm/min. Maximum speed is 40 rpm. Two flanges prevent the mouse from leaving the rod. They are 30 cm in diameter (this could probably be reduced to 20 cm). Their separation is set at 6 cm (maximum) but may need to be adjusted smaller for sub-adult mice if they tend to turn around on the rod. The bars are made of brass, 38 cm long, held 49 cm above the bench surface by a wooden support column at each end. The columns are secured to a heavy wooden base. Three bar diameters are available: 2, 4 and 6 mm. The 2 mm bar is the standard one we use, but many mice reach maximum scores on this. Therefore larger diameter bars have been included in an attempt to refine the test, as mice cannot grip these so well. Five wooden dowels or rods of varying thickness (35 (rod 1), 28, 22, 15 and 9 (rod 5) mm diameter) each 60 cm long are fixed by a G-clamp to a laboratory shelf such that the rods horizontally protrude into space (Figure 4). The end of the rod near the bench has a mark 10 cm from the end, to denote the finishing line. The height of the rods above the floor is 60 cm. If a shorter and less detailed test is required, use only the largest, smallest and middle rods. Van Dellen et al.14 used only a single rod to assess the progress of Huntington's disease in mice. Two parallel steel bars 1 m in length and 4 mm in diameter are fixed 30 mm (on their centers) apart by wooden supporting columns at their ends (Figure 5). The bars are 60 cm above the floor. For all tests, bring mice to the experimental room 5-20 min before testing, to ensure they are fully awake. As a general rule, to allow recovery of muscular strength and a return to normal levels of arousal, rest the mice by a return to the home cage after each motor test. Set the rotarod with a start speed of 4 rpm, acceleration rate 20 rpm/min. Holding the mouse by the tail, and place it on the rotating rod, facing away from the direction of rotation so it has to walk forward to stay upright. This is easiest to do if the mouse is brought up towards the rod at an angle of 45° below horizontal; attempting to lower the mouse from above will result in it spreading its hind legs and grasping the edges of the flanges. Quickly release the mouse when it is almost touching the rod, just forward of and above the rods top dead center, enabling it to easily grip the rod. A (probably easier and more reliable) technique is to use a thin (10-15 mm) dowel. Holding the mouse in one hand, lower it on to the dowel, parallel to the long axis. The dowel is angled with the mouse's head downwards about 30° to give it more time to grip the rotarod once it is released. Lower the mouse and dowel between the flanges of the rotarod, and once over the rotating rod the pull the dowel downwards away from the mouse, which will grasp the rod and walk forwards. At 10 sec after placing the mouse on the rod, start acceleration (as long as the mouse is facing forward: if not, wait till it does face forward before starting acceleration), and note the speed at which the mouse falls off. If it falls off before 10 sec, note the time of fall and try again, up to three times in total, recording the speed at the first fall after the 10 sec point. However, falls before 5 sec which are due to poor placing by the experimenter should not be recorded. The mean speed at fall is the datum; rather than using the maximum speed, this corrects for the extra practice the mouse receives during the failed runs, which it is assumed would assist performance. Thus a mouse that falls before 10 sec once then stays on till 12 rpm the second time scores (4+12)/2 = 8 rpm. A mouse falling twice then staying on for 10 rpm scores (4+4+10)/3=6 rpm. If a mouse fails to grip in 10 sec three times assign it a score of 4 rpm. One problem is that mice sometimes stop walking forward and grip the rod firmly instead, so that they passively somersault round, although most eventually fall off. It might therefore be useful to also note the speed when the first such inversion occurs. A possible solution might be to use a rod with a larger diameter or less pronounced ridges. As mice find it easiest to grasp the narrow 2 mm bar, it is advisable to test them first on this one. Holding the mouse by the tail, place it on the bench in front of the apparatus, slide it quickly backwards about 20 cm (this aligns it perpendicular to the bar), rapidly raise it and let it grasp the horizontal bar at the central point with its forepaws only, and release the tail, simultaneously starting the stopclock. This can be difficult to achieve efficiently; some mice grip better if the tail is released suddenly; if they feel they are still supported they may fail to grip. The criterion point is either a fall from the bar before the mouse reaches one of the end columns of the bar, or the time till one forepaw touches a column. Maximum test time (cut-off time) is 30 sec. If the mouse fails to grasp the bar properly first time and this appears to be attributable to the experimenter's technique, rather than the mouse, try again (after a brief rest while another one or two mice are tested) and do not record this fall. If the mouse falls before 5 sec and this is apparently not due to poor placing by the experimenter, repeat up to three times in an attempt to get a >5 sec score. If >5 sec on the second attempt, do not do a third trial. Take the best score as the datum. A mouse that repeatedly fails to support itself for >5 sec scores only 1. If the triple-bar version is being used, if the mouse scores 5 on this first 2 mm bar it can then be tested on thicker bars, after a brief rest period while another one or two mice are tested. The scoring system for the 4 and 6 mm bars is the same as for the 2 mm bar, and the final score is the cumulated total. Thus a mouse that scores 5 on the 2 mm bar but falls from the 4 mm bar after 13 sec scores 5+3 = 8. NB as the optional use of 4 and 6 mm bars is a new addition to our protocol we do not yet have extensive experience with them. Place the mouse at the far end of the widest rod (nose tip one head's length from the end is ideal). Take two measures: orientation time (time taken to orientate 180° from the starting position towards the shelf) and transit time (the time taken to travel to the shelf end (nose beyond the 10 cm mark from the shelf end of the rod). Orientation is dependent on the mouse staying upright; if it turns upside down and clings below the rod, arbitrarily assign it (for statistical purposes) the maximum orientation score of 120 sec. Do not test it on smaller rods; also the transit time becomes the maximum value as a mouse that transits upright is obviously better coordinated than one which transits while hanging on upside down. If, after orienting, the mouse falls or it reaches the maximum test time (arbitrarily set at 120 sec) do not test it on smaller rods. For statistical purposes, assign mice falling are assigned 120 for that particular rod and for subsequent ones, as it is assumed they would again fall from a narrower rod. If the mouse turns upside down, also note this event; for successful transit as well as orientation it must stay upright on the rod. Otherwise assign it the maximum score. Remove the mouse after it reaches the end of the rod or falls. After testing on one rod return the mouse to the home cage to rest while you test another mouse. Then place it on the next smaller size rod and test it in the same way again. Stop testing if the mouse falls off a rod after being on it for more than 5 sec. If it fell off in less than 5 sec replace it and allow another attempt (as falling within 5 sec could be due to faulty placing by the experimenter), for a maximum of three trials, and use the best result. Place the mouse in the center of the two bars with its longitudinal axis perpendicular to that of the bars; both front paws should be on one bar, both hind paws on the other bar. 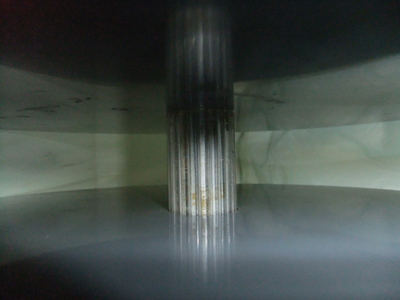 Scoring is similar to that for the static rods. Take two measures: the time taken until the mouse orients 90° to the start position, and the time until it subsequently reaches one of the end supports. If the mouse turns upside down, also note this event. As for the static rods test, orientation and transit must be achieved without it turning upside down, otherwise the maximum time is allotted. It is rare for reasonably healthy mice to fall in less than 5 sec; if this does happen it is probably due to poor placing. Therefore discard the result and retest the mouse. A static rod was originally used to monitor the progress of Huntington's disease in mutant mice, with or without environmental enrichment in their home cages14. The enrichment programme dramatically delayed the onset of motor dysfunction on the rod, which was paralleled by a delay in the onset of hind paw clasping, a general sign of neurological impairment. Scrapie-infected mice showed a decrease in horizontal bar performance from week 16 post-injection, in rotarod testing from week 18, and static rods from at least week 198 (earlier testing was not performed). KATP channel subunit Kir6.2 KO mice were impaired on the static rods and horizontal bar, but not on the rotarod4. Hippocampal lesions had no effect on any measure of motor ability5, but 129S2/Sv mice were impaired relative to the C57BL/6 strain on the rotarod and static rods3. C57BL/10 mice also had worse motor performance than C57BL/6 mice6, although not to the same extent as 129S2/Sv mice. Figure 2. Detail of the knurled rod of the rotarod. Figure 3. The triple horizontal bars. The bar held in the notches is the basic 2 mm one; tacked beneath it (for demonstration purposes only) are the 4 and 6 mm bars. In practice, only one bar at a time is slotted into the notched supports. Figure 4. A mouse traversing a static rod. Figure 5. A mouse on the parallel bars. Padding has been omitted for demonstration purposes only. The Wellcome Trust for providing Open Access funding to Oxford University. Robert Deacon is a member of Oxford OXION group, funded by Wellcome Trust grant WT084655MA. Barclay, L. L., Gibson, G. E., Blass, J. P. The string test: an early behavioral change in thiamine deficiency. Pharmacol. Biochem. Behav. 14, 153-157 (1981). Cain, D. P., Saucier, D., Boon, F. Testing hypotheses of spatial learning: the role of NMDA receptors and NMDA-mediated long-term potentiation. Behav. Brain Res. 84, 179-193 (1997). Contet, C., Rawlins, J. N. P., Deacon, R. M. J. A comparison of 129S2/SvHsd and C57BL/6JOlaHsd mice on a test battery assessing sensorimotor, affective and cognitive behaviours: implications for the study of genetically modified mice. Behav. Brain Res. 124, 33-46 (2001). Deacon, R. M. J., Brook, R. C., Meyer, D., Haeckel, O., Ashcroft, F. M., Miki, T., Seino, S., Liss, B. Behavioral phenotyping of mice lacking the KATP channel subunit Kir6.2. Physiol. Behav. 87, 723-733 (2006). Deacon, R. M. J., Croucher, A., Rawlins, J. N. P. Hippocampal cytotoxic lesion effects on species-typical behaviors in mice. Behav. Brain Res. 132, 203-213 (2002). Deacon, R. M. J., Thomas, C. L., Rawlins, J. N. P., Morley, B. J. A comparison of the behavior of C57BL/6 and C57BL/10 mice. Behav. Brain Res. 179, 239-247 (2007). Dunham, N. W., Miya, T. S. A note on a simple apparatus for detecting neurological deficit in rats and mice. J. Am. Pharm. Assoc. 46, 208-209 (1957). Guenther, K., Deacon, R. M. J., Perry, V. H., Rawlins, J. N. P. Early behavioural changes in scrapie-affected mice and the influence of dapsone. Eur. J. Neurosci. 14, 401-409 (2001). Jones, B. J., Roberts, D. J. The quantitative measurement of motor inco-ordination in naive mice using an accelerating rotarod. J. Pharm. Pharmacol. 20, 302-304 (1968). Kondziela, W. Eine neue method zur messung der muskularen relaxation bei weissen mausen. Arch. int. Pharmacodyn. 152, 277-2784 (1964). Lindsey, J. R., Baker, H. J. Historical foundations. The laboratory rat. Suckow, M. A., Weisbroth, S. H., Franklin, C. L. 2nd, Elsevier Academic Press. (2006). Metz, G. A., Whishaw, I. Q. Cortical and subcortical lesions impair skilled walking in the ladder rung walking test: a new task to evaluate fore- and hindlimb stepping, placing, and co-ordination. J. Neurosci. Met. 15, 169-179 (2002). Sigurdsson, E. M., Brown, D. R., Daniels, M., Kascsak, R. J., Kascsak, R., Carp, R., Meeker, H. C., Frangione, B., Wisniewski, T. Immunization Delays the Onset of Prion Disease in Mice. Am. J. Pathol. 161, 13-17 (2002). van Dellen, A., Blakemore, C., Deacon, R., York, D., Hannan, A. J. Delaying the onset of Huntington's in mice. Nature. 404, 721-722 (2000). Vandeputte, C., Taymans, J. -M., Casteels, C., Coun, F., Ni, Y., Van Laere, K., Baekelandt, V. Automated quantitative gait analysis in animal models of movement disorders. BMC Neuroscience. 11, 92 (2010).